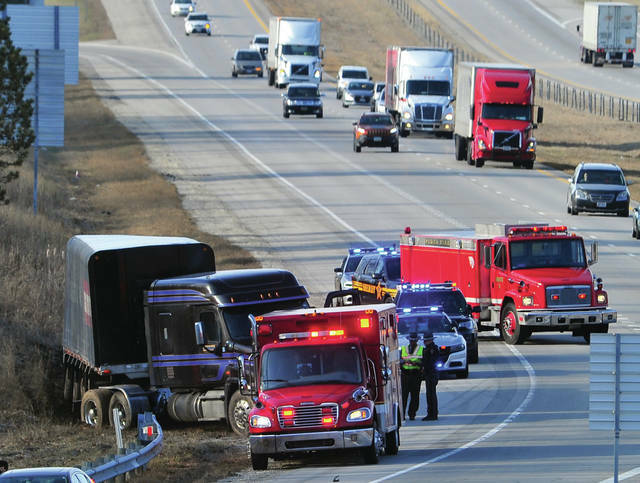 Mike Ullery | Miami Valley Today First Responders work at the scene of a semi crash on southbound I-75 at the 82 mile marker on Wednesday afternoon. It is believed that the truck driver suffered a medical condition before crashing off the right side of the road. He was transported to Upper Valley Medical Center by Piqua Fire Department medics. First Responders work at the scene of a semi crash on southbound I-75 at the 82 mile marker on Wednesday afternoon. It is believed that the truck driver suffered a medical condition before crashing off the right side of the road. He was transported to Upper Valley Medical Center by Piqua Fire Department medics. https://www.dailycall.com/wp-content/uploads/sites/30/2019/03/web1_032719mju_crash_i75.jpgMike Ullery | Miami Valley Today First Responders work at the scene of a semi crash on southbound I-75 at the 82 mile marker on Wednesday afternoon. It is believed that the truck driver suffered a medical condition before crashing off the right side of the road. He was transported to Upper Valley Medical Center by Piqua Fire Department medics.